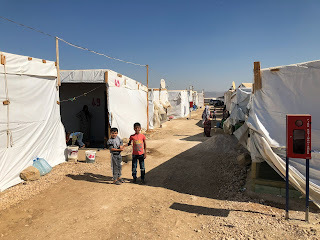 During breakfast on my second day in Lebanon, I was greeted by the phrase, "In a few minutes, we're going to travel to the NGO host offices and receive a security briefing." What did that mean? My first thought was..."OK...here we go!" What was about to happen? We Ubered to the host offices of World Vision and went into a conference room. As we sat in around the table, the security staff person came in the room. He greeted us and then pointed to a map of Lebanon. He began describing the multifaceted history of Lebanon, it's conflict and war with Israel, and the more recent attempts of ISIS to take over parts of Lebanon. He showed us the Southern border on the map that Hezbollah controls and the Northern area of Lebanon where ISIS was trying to cut a path from Syria to the coast to establish a supply line. All of this information was fascinating! He also showed us the areas that were once ISIS hot spots but now were liberated and safe to travel in. One of those areas was in the Central part of the Bekaa valley, the place we'd be traveling to on this particular day. The place that the Travel.state.gov site said not to go to! I'm not going to spend a lot of time talking about the preparations that World Vision goes through in order to bring in a team, but let's just say that they are incredible and very thorough, and I felt very safe and secure while I was with them. You might know World Vision as the child sponsorship organization you see on TV, but let me tell you, they are WAY more than that! They are a world leader in helping and serving the poor around the world and they have ALL their bases covered! In many ways, they exceed any help you could get from the US Embassy. After our briefing, we boarded a van and set out for the first of two refugee camps. 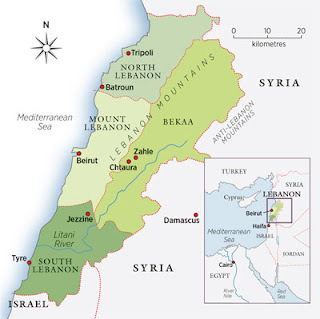 Beirut is located on the coast but the coast meets the mountain ranges very quickly. We were on a constant ascent to the peaks of the Lebanese mountains. As we started our descent, we went through a populated area of the Bekaa valley. While in the valley, we were surrounded by the Lebanese mountains on one side of us and the Syrian mountains across the valley. Those were the same mountain ranges where ISIS had recently been posted up but were recently driven out. The Bekaa Valley is a rich and vast farmland. As we drove, our host pointed out several refugee camps along the way until we finally rolled up on the first camp we would visit. In Lebanon, it is actually illegal to have formal Refugee camps, so all of the camps are referred to as temporary. 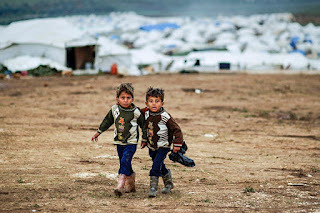 Lebanon has a population of 4 million people with an additional influx of 1.5 million Syrian refugees! Do the math on that and you will see that Lebanon is being crushed by the socio-economic impact of this crisis! The temporary camp we were visiting was recently rebuilt after a July fire that completely destroyed the camp in 30 minutes! Imagine living in a temporary camp with minimal personal belongings and in a matter of 30 minutes, the rest of EVERYTHING you had was lost! All the people could do was grab their loved ones and make their way to a nearby open farm. World Vision has been very much a part of the rebuild, providing much needed clean water and clean toilets. There are 100 families that live in 100 "Tents" that are made of a basic wood framing, with tarp-like plastic walls and roof. The structures have a couple of rooms, most have no beds, and families might have a woven mat and a few pillows. That is it! 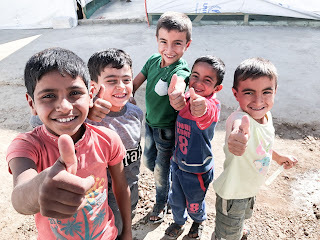 As we walked through the camp, we were greeted by smiling children who were eager to have their photos taken with us, and then we made our way into one of the tents. We sat down with a family who shared their nightmare journey from the bombs of Syria and ISIS torture to the barely adequate accommodations in which they are currently living. Each family we spoke with had a similar experience, much different from the thriving lives they once knew before war broke out in Syria. Desperate for work, but with few opportunities, they felt helpless. All of them would go home to Syria in a heartbeat if it was safe to do so. With winter rapidly approaching, these families do not even own a blanket. I wondered how they will survive the freezing temperatures that are right around the corner. I was so full of emotions while hearing their stories! Why was this happening? They went from having everything they needed in Syria to fleeing and having NOTHING! And there I sat, out of place in that context knowing that in a few days I would go home to a very different looking world. I would return to a world of vast affluence, one with so many opportunities and with what would seem like endless resources back home! My heart was being broken and tested. This felt so overwhelming as I realized I was currently with only 100 families out of 1.5 million refugees in Lebanon. I felt my heart filling with anger and resolve that somehow I would find my place to help, and I would influence as many others as I could to do the same. As we said our goodbyes, we got in our van and prepared to go to a second refugee camp. The next one would rip my heart out in a brand new way. Stay tuned.